Friends know that my constant, back-burner obsession is the vast web of Italian-Egyptian connections. For my 29th birthday my classmates in Cairo gifted me an Italian-Arabic dictionary. From the ubiquity of red sauce in Egyptian cooking to the story behind Verdi’s Aida to the wabur––oh, the wabur and its many-splendored meanings––I’m convinced there are the makings of a second academic book somewhere in there. But I’m getting ahead of myself: I’m still working on the dissertation project that will become the first book, and to that end I’m wrapping up an eventful and productive four months in Egypt. 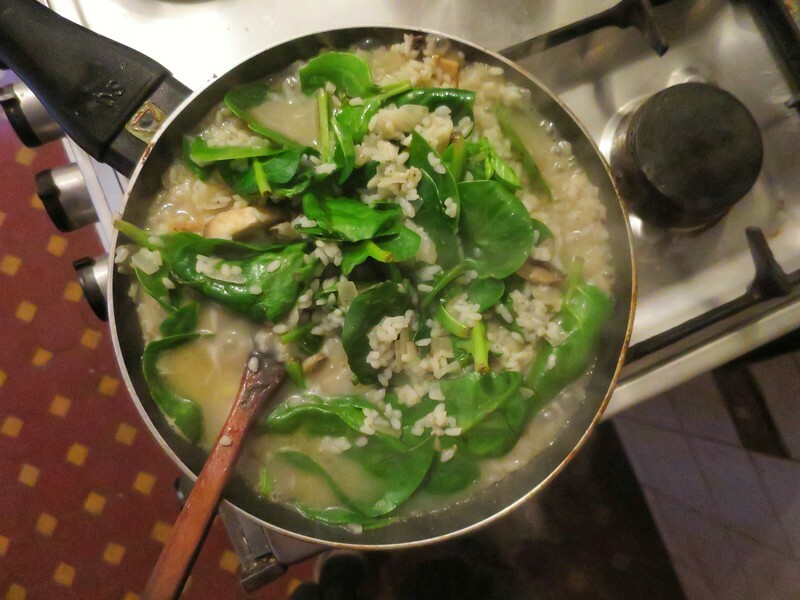 The last meal I cooked here was an experiment of sorts, related to the Italy-Egypt nexus: what happens when you make a risotto-style dish with Egyptian short-grain rice? The idea came to me while watching a lecture by Amy Riolo about Egyptian food. She suggests that Egyptian rice, which is short-grain and has been in cultivation for a very long time, was the basis for rice varieties that came to be grown around the Mediterranean and eventually resulted in Arborio and other varieties we typically associate with risotto dishes. And so instead of embarking on my usual hunt for Arborio in the fancy supermarkets of Cairo, I decided to buy some local rice and conduct a little New Year’s experiment. It was…very delicious. The Egyptian rice got very starchy very fast, producing that delicious, creamy risotto depth of flavor and texture. It was perfect for a cool but sunny winter day. 1. Heat your broth to boiling, then turn off the heat. 2. 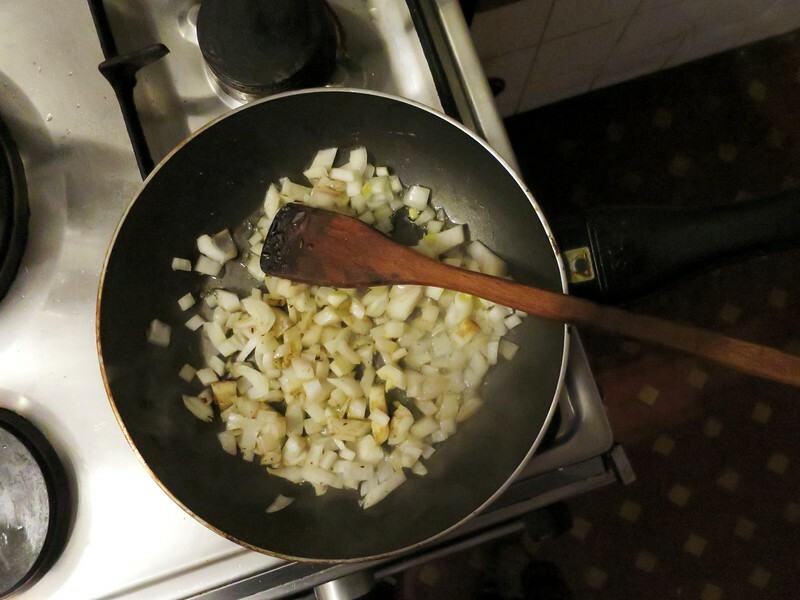 Brown your onions in a generous amount of olive oil. Add spices (but not the salt). Stir in the rice once the onions are browned and ensure all the grains are coated with oil. 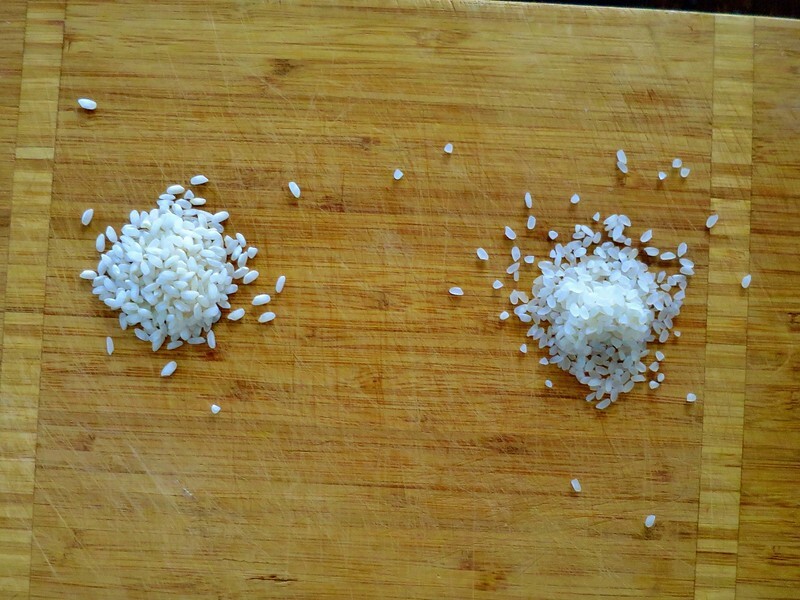 When the rice begins to pop and crackle, add enough white wine to cover the rice (if not using wine, use broth instead). Adjust heat to medium-high; the liquid should be constantly evaporating, but not too quickly. 3. Once the liquid evaporates, add a full ladle of broth and stir well. Monitor the rice and continue to add broth. At the second addition of broth, stir in the mushrooms. At the third, taste for salt and season as needed. 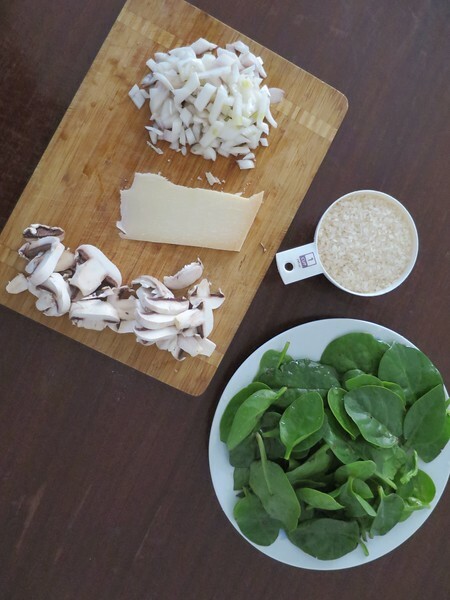 Add the spinach once you are happy with your salt level (I like to add baby spinach whole, but you can tear into smaller pieces if you prefer). 4. Continue adding broth, a half cup to a cup at a time, for twenty minutes or so, or until the rice is a nice chewy al dente but not too mushy and little liquid remains. Once it’s just about there, turn the heat off and stir in a bit more broth and a generous amount of grated cheese. Allow to sit for five minutes or so before serving with more cheese.